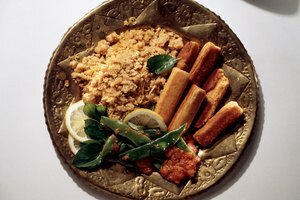 Soy flour contains no gluten or grains and adds protein to a recipe, making it a popular substitute for wheat flour. However, some people wish to avoid soy flour because of an allergy, other health reasons, or due to the fact that the flour can have a strong bean-like flavor and transfers that flavor to recipes that contain it. Substitute other flours for soy in appropriate ratios based on your dietary needs and taste preferences. If you're not using a recipe that contains soy flour because of a grain allergy or gluten intolerance, or because you're following a low-carb diet, simply switch it back to traditional all-purpose or whole-wheat flour. Use 1 cup of wheat flour for every 3/4 cup of soy flour in the recipe. Because soy flour contains so much protein and also may act as a binder in the recipe, consider adding additional binder such as an extra egg when substituting wheat flour for soy. If you have a gluten intolerance or wheat allergy, you can still substitute flours made from other grains for soy flour. Use a scant cup of finely ground corn flour for each 3/4 cup of soy flour, or a 1-to-1 ratio of more coarsely ground cornmeal to soy flour. Measure an equal amount of rice flour to substitute for soy flour, but then add a tablespoon or 2 of rice flour as needed in the recipe. Use 1 cup of rye flour for every 3/4 cup of soy flour, but expect a vastly different and quite pungent flavor. Since soy flour is made from a legume, the soybean, flours made from other legumes, such as peanuts or garbanzo beans, substitute for soy flour in a 1-to-1 ratio and also help provide protein in the recipe. Lesser-known legume flours include urad flour, made from lentils; and mung bean flour, found in a type of thin noodles common in India. 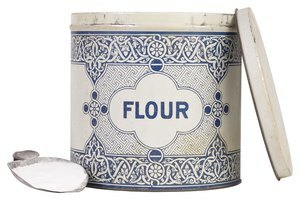 Coconut and almond flours can also substitute for soy flour, especially in breading recipes or in baking quick breads. Substitute almond flour for soy flour using a 1-to-1 ratio. Use less coconut flour in recipes: approximately 1/2 cup of coconut flour for every cup of soy flour. Since coconut flour absorbs water, increase the liquid ingredients by at least 1/3 cup and add an extra egg if applicable. When using flax meal as a substitute for soy flour, use half as much, and soak it in the liquid ingredients for at least 1/2 hour before cooking or baking to give the flaxseeds time to expand and soften.